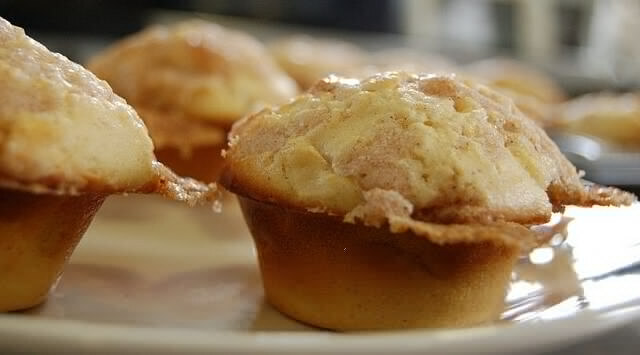 This recipe is different than your usual muffin recipe. As with all of the recipes I made this week, it requires soaking your grains overnight. The reason for doing this is that it breaks down the phytates in the grains, which makes them much more digestible and the nutrients much more readily absorbed. For more information about this, see this article. Add the flour to a large bowl, stir in your choice of cultured dairy until well mixed, then cover with a cloth and leave in a warm place and leave for 12-24 hours (the longer, the better). The recipe notes that if you have dairy allergies, you can substitute 2 cups of water with 2 Tbsp of either whey, lemon, or vinegar instead, for soaking the flour. 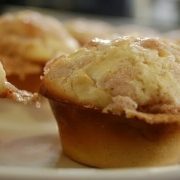 Pour into well-buttered muffin tins, filling about 3 quarters full. Bake at 325 C for about 1 hour, or until toothpick comes out clean. (Note- I find this recipe makes an odd amount, around 15 muffins, so it would be more convenient to double it.) Also, note that soaked flour recipes take longer to bake than traditional baking recipes- they really do need the full hour, occasionally a little longer! Fantastic, thanks for sharing it!!! Great, can’t wait to try these. Thanks for sharing the recipe. Hey I was just thinking, you probably meant to say bake at 325 degrees Fahrenheit, rather than Celsius. It works out to be about 170 degrees Celsius. @Emma, Yes, you’re right that it’s F not C. Thanks for catching that! OK, so I’ve had an epic fail. My muffins turned out blackened on the outside but still gooey in the middle. I turned the heat down to 150 C when I saw they were going black, but it didn’t seem to help. What could I have done wrong? I used 1/3c honey and 3 apples. Do you think I had too many liquid ingredients? @Emma, Possibly. Were your apples quite big and juicy? That and the little bit of extra honey could have pushed it over the edge with being too liquid? Also, honey darkens faster than other sweeteners, so you do have to really watch it and sometimes adjust the temperature while it’s cooking. The other question would be did you soak the grains for a full 12 hours? Soaking them sufficiently is part of what allows the recipe to not be too goopy. If they don’t get the soaking time, then I could see them not baking properly. It’s part of the method, the long soak and then the long bake. If I don’t have any buttermilk, kefir, or yoghurt on hand can I use milk with vinegar?